Jean Packard and her husband Vern. 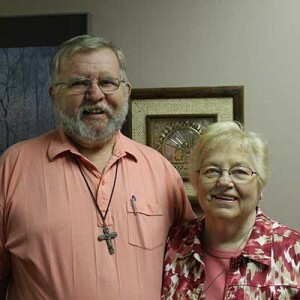 There are several of the Pope Paul VI Institute’s employees who have served the Institute for many years, and this is especially true for Jean and Vern Packard. While Jean’s tenure at the Institute dates back to its founding in 1985, she has worked with Pope Paul VI Institute founder, Dr. Thomas Hilgers, since 1978 when she was hired by Hilgers to fill a grant-funded position. “I was working at Creighton at the time, and when the opportunity to work with Dr. Hilgers became available, I knew I just had to work for this man who had this fire in his eyes when he spoke about his research,” Packard recounts of her decision to take the position. It was seven years later when Packard followed Dr. Hilgers to the newly-founded Pope Paul VI Institute, which occupied the second and third floors of the newly-built structure at 6901 Mercy Road. At that time, she completed the one-year FertilityCare Practitioner Program. In addition to this, Packard also developed newsletters and brochures, and for 10 years, she coordinated the Institute’s affiliate organization, FertilityCare Centers of America (FCCA). In addition to the many professional accomplishments Packard experienced as an Institute employee, it is her return to the Catholic faith that is among the most meaningful effects of her tenure. “The witness of the staff here and of Dr. Hilgers had a tremendous impact on me,” Packard says.